My £2.00 Coin Piggy Bank (see wonderful picture below – hee hee) was starting to get really, really heavy, so I emptied it out and a massive 44 coins are in there saved since last December. I popped into the bank this afternoon and put £50.00 of it into the savings account – hooray. The balance of 19 coins can stay in there until there’s another £50.00 to bank. How many £2.00 Coins have you saved…..
To view the latest list of members and savings ... Click Here. Last edited by GreenFingers; 02-07-2006 at 2:52 PM. "Some days you're a Pigeon...some days you're a Statue"
no £2's saved at the moment but I shall do this to save for Christmas so will keep you posted. I have £34 in £2 coins saved since the end of December. Not bad. I thought I hardly ever got £2 coins until I started saving them. I have got £46 in there since December! Hooray! This is a great idea, think I will start saving the £2 coins from now on. I save coppers and 5p coins in a piggy bank at the mo. Well, not really a "piggy" bank as its shaped like a VW camper van.... anyway *back to topic*, I recently emptied it and after an hour of counting had £30 in there. Was almost too heavy to carry to the bank but went straight in the savings account when it got there, every little helps! Perhaps I will start putting £2 coins in too and the surprise will be even better next time! Good luck everyone!! I love your posts they always make me laugh! I don't often get £2 coins either, started the challenge last month, got one and then spent it so will try to get on the wagon again! well i did have 2 till my mum 'borrowed' them lol, and they came back as 20ps and 10ps. But when i have them they go in my pink pig/cow and in my big frog i have 1ps and 2ps and in my little star piggy bank i have 5ps. I also have my huge camper van but i dont want to fill that as i am worried i will break it and i have waited 3 years for that money box. My OH has been collecting one of each new £2 design for a year or so and has a jar full. I haven't counted them. That's his pocket money! If you want to collect one each of the different designs of £1 that's interesting to do and get the kids involved looking for them amongst the change. i also save 20p and 5p and usually get around £95.oo saved a year which then goes into the kiddies saving account. If it doesnt pay rent sell it. It's a great idea and you don't miss £2. What a good idea I'll start this too i have got one £2 coin I too like fairylights don't come across them very often so i'll save the ones I get as I'm sure I won't miss them. 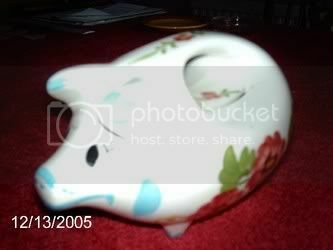 I have just got a piggy and started saving £2 coins. Only have £4 in so far! !